5 BR (4 Up: K, Q, D+S, D+S, DSS + SSS, 1 Dn: D) Sleeps 12 - 15, 3 BA (2 up, 1 dn). 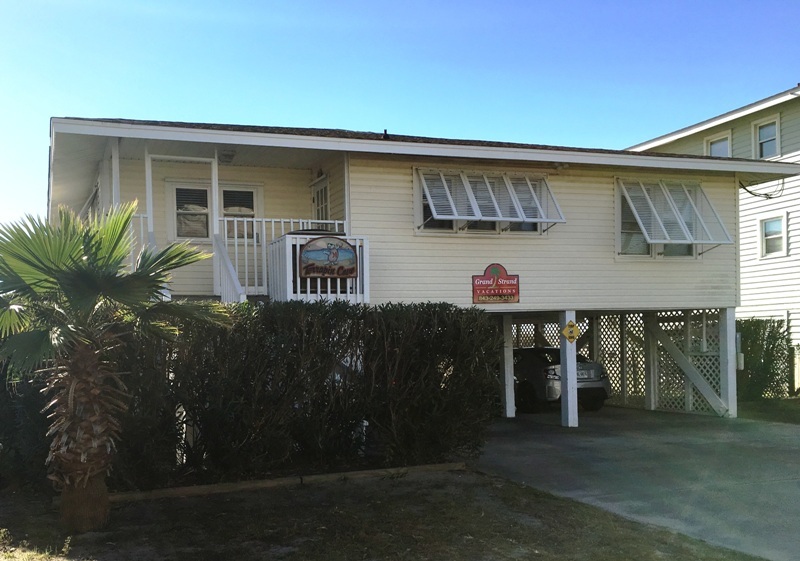 C-H/A, Ceiling Fan, DW, MW, W/D, 4 C-CATV (40" SMART HDTV- in LR), DVD, Wi-Fi, Stereo, Covered Porch, Hardwood Floors, Oceanfront Sundeck, Bahama Shutters, Beach Shower, Walkway to Beach, Paved Covered Parking, DN: Outside Entrance Only, Non-Smoking. *Max Parking 5 Cars. Located in a dune area, Terrapin Cove is surrounded by nature. From its balcony you can enjoy lovely and scenic views of the Atlantic Ocean. This somewhat secluded area is quiet, peaceful and serene. Still, it is a short walk from the beach and pier where you can partake of a day of fishing. When you are ready to stroll the beach or take a dip in the ocean, Terrapin Cove offers a private path to there. On your way back, rinse off at the convenient beach shower before entering the home. This vacation property offers everything you’ll need to create a memorable North Myrtle Beach vacation. Terrapin Cove is a great option for large families or groups looking to getaway together. It offers 5 bedrooms, 4 up and 1 down, along with 3 baths. Its lower level bedroom with its private entrance makes for the ideal master suite. Other features of this home include a living area with a large flat screen tv and DVD player, complimentary wi-fi and a fully equipped kitchen with microwave, dishwasher and washer/dryer. Private outdoor spaces such as a covered porch and oceanfront sundeck further provide for relaxing, dining or enjoying group fun in the sun. Call today to reserve this beach house for your next South Carolina vacation. Well insulated and equipped with central heating, central air conditioning and ceiling fans, it is comfortable year-round. This vacation property can be rented by the day or week.